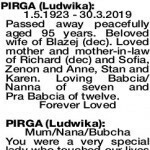 The Funeral Service for Mrs Ludwika Pirga of Bassendean will be held in Bowra & O'Dea's Chapel cnr Great Eastern Hwy & Robinson Road, Bellevue commencing at 10.30am WEDNESDAY (1.5.2019). 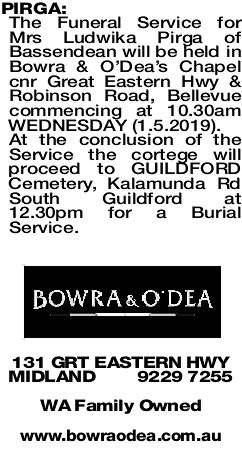 At the conclusion of the Service the cortege will proceed to GUILDFORD Cemetery, Kalamunda Rd South Guildford at 12.30pm for a Burial Service. 1.5.1923 - 30.3.2019 Passed away peacefully aged 95 years. Beloved wife of Blazej (dec). Loved mother and mother-in-law of Richard (dec) and Sofia, Zenon and Anne, Stan and Karen. Loving Babcia/ Nanna of seven and Pra Babcia of twelve. Mum/Nana/Bubcha You were a very special lady who touched our lives and many others. Your caring nature and warm heart will always be remembered. Love you always. Richard (dec), Sofia, Shane, Rosalie, Kayelee, Kalten and Kimberly. Mum, you loved us all, family always came first. In love we thank you and will hold you dear in our hearts - Anne and Zenon, Tim, Jai and Blaze, Andrew and Helen with Melody, Ebony and Ethan, Matthew and Danica with Milah. Yes, I know, you need more chook food. Mum - What a Life. You survived so many challenges, raised three boys and their families, always ready to help. Time to have a rest. "Yes we have eaten"
Love Stan and Karen, Sylee and Jarred, Julian and Loran, Elise and Kyle and their families. With many happy memories of Mrs Pirga, we offer our deepest sympathy to Stan, Karen, Sophie, Zenon, Anne and families on the sad loss of their loved Mum and Nanna. To know her was to love her. In God's care.